Designed for the accurate measurement and control of process steam by steam flow meter for end-of-the-run applications: steam injection to process ovens, atmospheric blanchers, sparging tanks, steam eductors, and other applications where steam is exhausted through a pipe manifold or nozzles to near atmospheric pressure. The mass flow rate of steam is indicated in pounds per hour on an easily understood calibrated panel gauge. Installed in series with the steam piping, the meter is inherently simple and rugged. Fully mechanical in operation, there are no moving parts to maintain or replace. There are no obstructions in the steam flow path. Internal wetted parts are manufactured from 300 series stainless steel for long-term durability and corrosion resistance. Metering components were selected to withstand demanding industrial use including continuous operation, repeated chemical washdown, and outdoor applications. Operating on critical flow principles, the meter design incorporates a proprietary venturi flow nozzle characterized by a convergent bellmouth inlet, minimum area throat, and conical diffuser. Upstream pressure is converted to velocity as steam flows through the converging inlet. The velocity increases along the restrictive inlet until sonic velocity is achieved at the nozzle throat. The sonic velocity or speed of sound, is the maximum obtainable speed at which the flow may pass through the nozzle throat. The sonic velocity is converted back to static pressure in the diffuser. For the system to operate correctly, a small pressure drop across the nozzle is required. The proprietary inlet, throat, and diffuser design is such that the exit pressure may be as high as 90% of the inlet pressure for acceptable operation. Steam to atmosphere and open tank applications easily meet these operating conditions. The steam flow meter is an in-line device which will operate in any flow orientation. If desired, the meter may be reconfigured in the field to a different flow direction. The steam flow rate is controlled by throttling on the inlet side of the steam flow meter. Manual and specialty control valves, or pressure regulators may be used as pressure reducing devices. When required, non-standard capacities, special construction, or other optional features can be provided. Steam flow meters are described by indicating the following combination of product features. Product code is STM. End Connections, F for Flange (raised face). Flow Direction selections are VD (vertical down), VU (vertical up), HR (horizontal right), or HL (horizontal left). 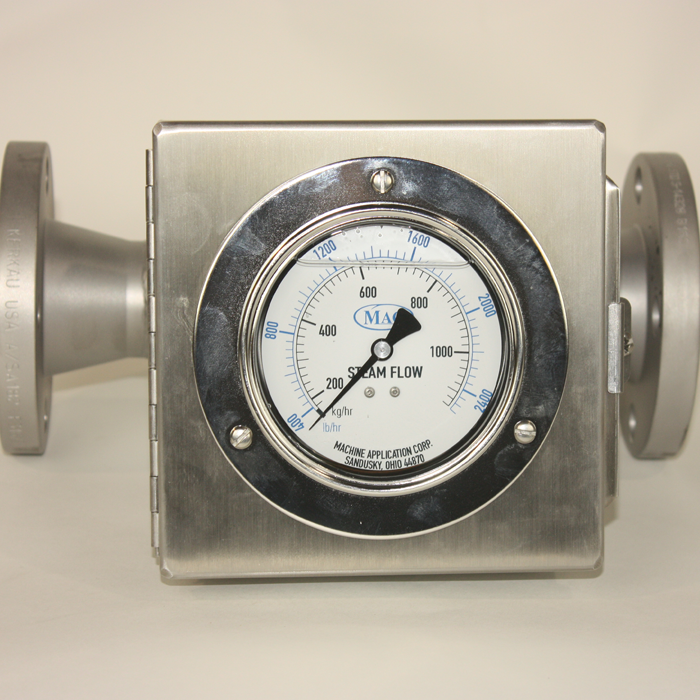 Example: STM – 1000 – 1.5 – F – HR is a steam flow meter with calibrated scale to 1000 LB/HR, end connections are 1 1/2″ Flange, with a horizontal flow direction, downstream to the right. Consult the factory for special configurations. 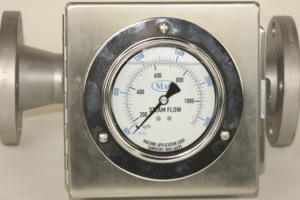 View the Steam Flow Meter data sheet in pdf form.